Two thirds of Jesus ministry was spent on education. At the base of each method of learning there is a foundational principle: Interaction. God in His infinite wisdom has designed different kinds of interations to enable us to know Him. By interacting with the Father, the Saviour, the Counselor and with each other, we learn about the Kingdom, its ways, its Master and its people. We believe that the ultimate interaction is worship. Through the boldness of praise and the intimacy of worship, we find ourselves in a place of total participation with the King and His people. This CD-Book wants to assist you in such a process, presenting the two different components of worship: the practical aspect  the music; and the theory behind it  the teaching. Our only goal is to facilitate your getting to know Jesus the Master and Jesus in us, our Hope in glory. This is eternal life  that we might know Him. 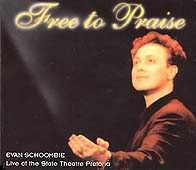 May you be inspired to be Free to Praise! Timoteo Alicino, All Good Gifts International.